A lesser known distillery that disappeared in the great distillery cull of 1983, North Port or Brechin, as it went by either name, is hard to find but often well worth the search and this 5cl miniature proves just that. A Scotch Whisky distilled by North Port Brechin and then matured for 17 years before bottling. 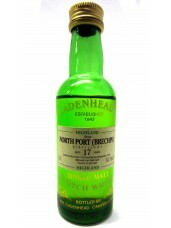 A rare bottling from the now demolished North Port/Brechin distillery, this 5cl miniature offers a great insight into this stunning North Port Brechin Whisky. "Please note, due to age and evaporation some miniature may be short filler." A creamy nose with sweet vanilla notes and a delicate smoke which continues onto the palate which has a smoky influence with a sweetness becoming more pronounced as time passes. The finish is again a sweet one with a smooth buttery influence as a delicate edge gradually appears.